The other weekend, Nick’s team at Google had a costume party, and the instructions were to dress as the best and worst people through history. 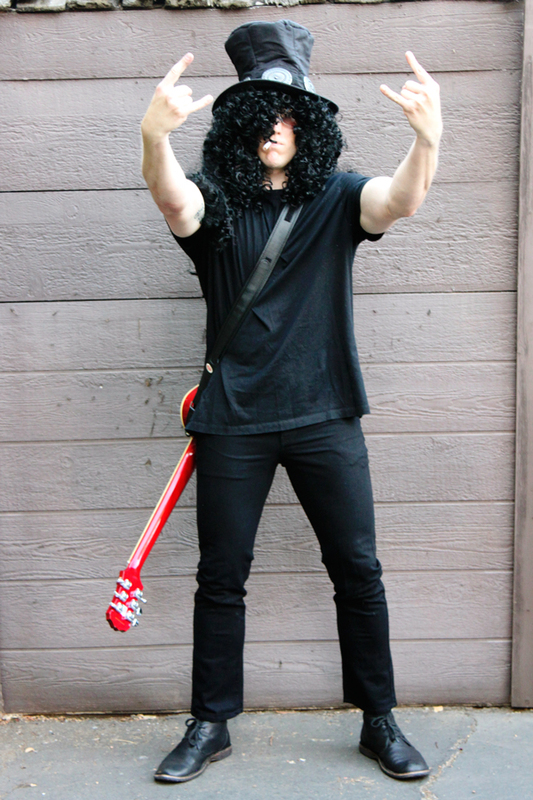 I was thrilled because there’s been a serious lack of theme parties in my life ever since I graduated from college. But then, we were stumped. Finding something “historical” that would be fun as a couple was trickier than we’d expected. Most couples costumes that came to mind—and to our computers during hours of Google searches—were fictional. I strongly petitioned for Justin and Britney circa 2001, or more specifically, Justin and Britney in their all-denim glory at the 2001 American Music Awards. Nick thought no one would get it. What?! Who wouldn’t recognize the most epic of matching pop star ensembles? “We’ll look like farmers,” Nick countered. We agreed to disagree. 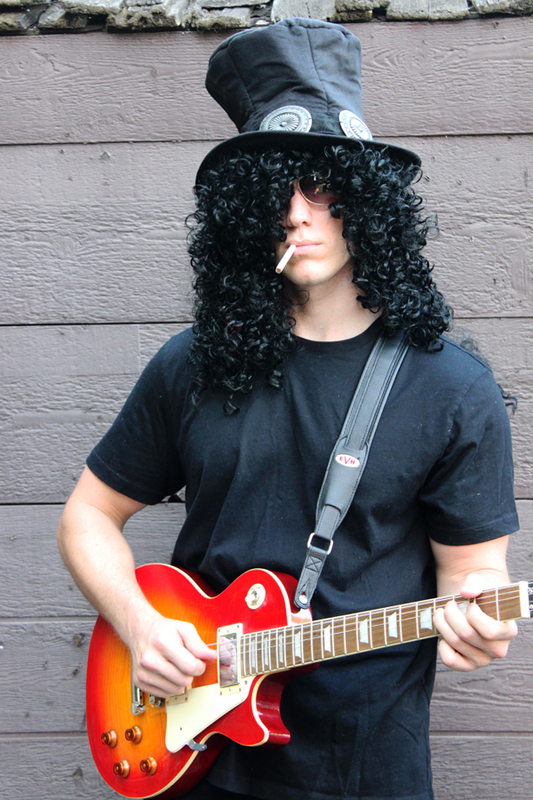 But there was another iconic musical duo that we agreed could work: Axl Rose and Slash from Guns N’ Roses. (Nick is mad at this transition since it suggests Britney and Justin are in the same class of musical renown as one of the greatest rock bands of all time. Again, we agree to disagree). 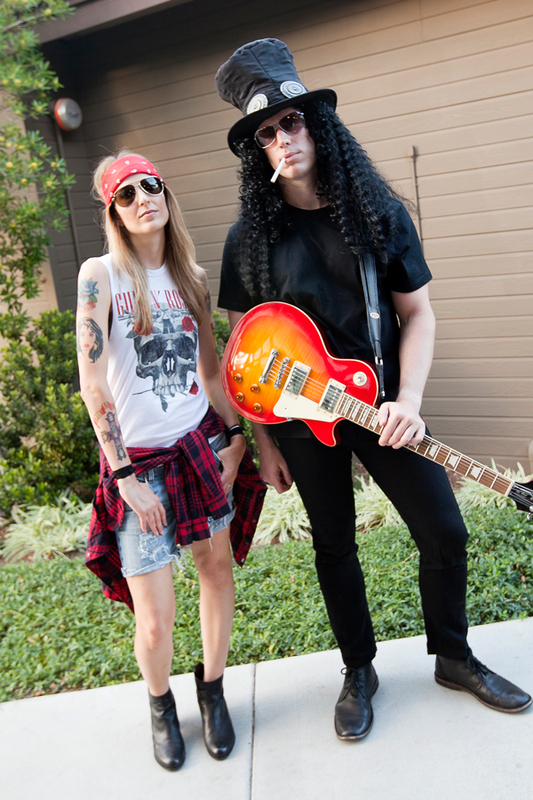 Axl and Slash each have such a look—Axl with his bandana and tank tops, Slash with his top hat and cigarette, and both with their aviators and signature ’dos—that it was pretty easy (and so fun!) to pull off. We decided that I’d be Axl since with the help of a flat iron, we pretty much have the same hair, making it one less wig to buy. Here’s how it all turned out. Welcome to the jungle! 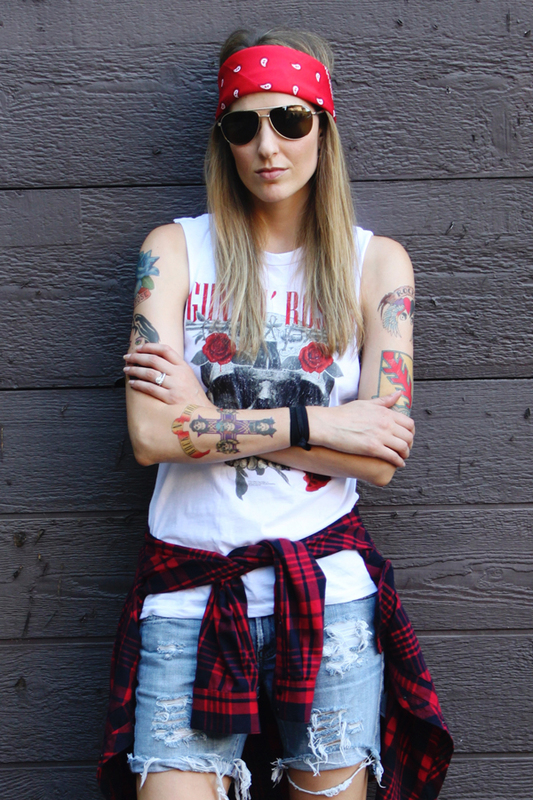 To complete Axl’s look, I also got some (temporary) ink. 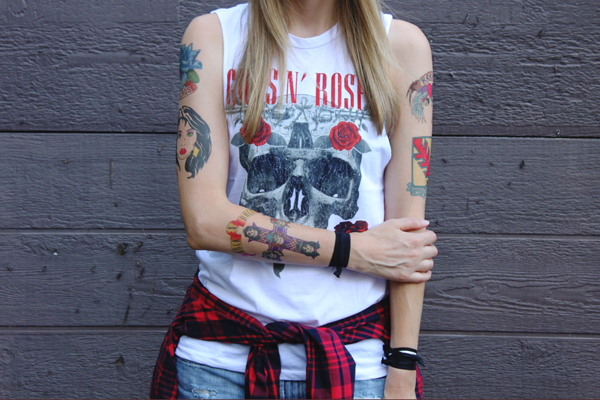 Yes, those are replicas of his actual tattoos, which I got from a professional Axl Rose impersonator via Etsy—proof that you can find anything on Etsy. For Slash, it helped that Nick plays guitar and was able to break into “Sweet Child O’ Mine” on command throughout the night. 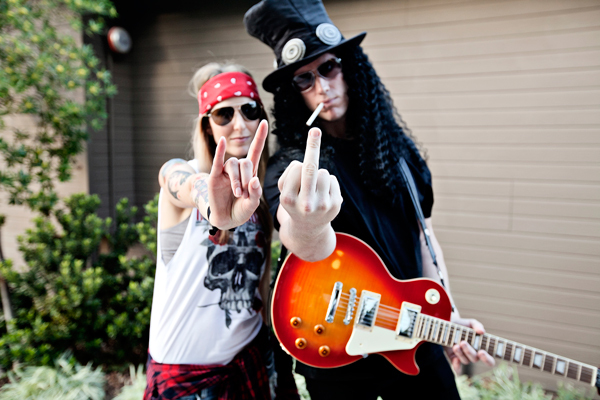 We had such an awesome time as Axl and Slash. We’ll definitely be rocking these costumes again come Halloween! How awesome is this?! Literally the best costumes I have seen, ever! Awesome! Where did he get the Slash hat? Thanks! The Slash hat came from Amazon.com (it also came with some hair!). Here's the link: http://goo.gl/c6W3Ue. 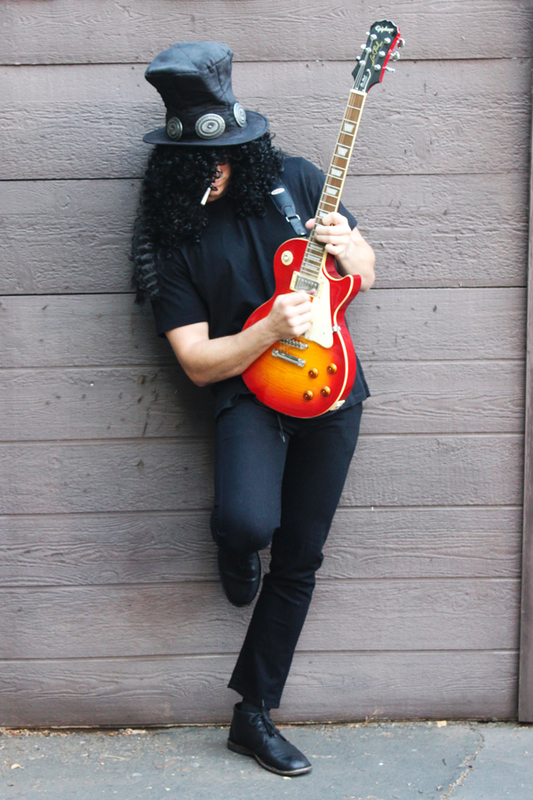 Nick also got another Slash wig from Amazon since the one that comes with the hat is a little sparse. He wore both together and it turned out great! Oh, the costumes are absolutely stunning! I love them so much! This is just amazing. Great costumes. Love these outfits!! 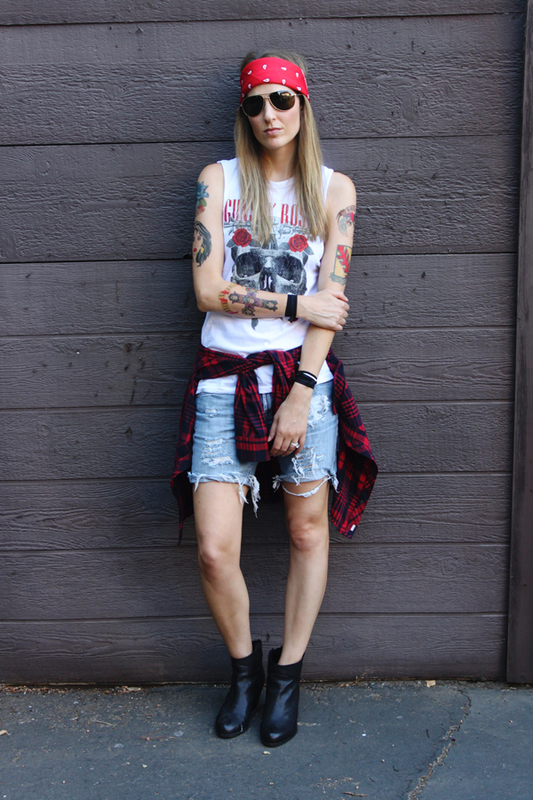 The tattoos look great! Where did you get your tank?